Whether you’re a podcast enthusiast or not, it’s become well-acknowledged that podcasts have serious influence and marketing potential. Being a guest on podcasts is a great, low-cost way to get your name out there, meet some fascinating hosts and their audiences, and familiarize yourself with one of today’s most impactful mediums. Maybe you’re launching a new course, podcast, or business, and you want to get the word out as fast and wide as possible. You’re excited about this project, and you want to share it with the world so it can make a big difference. And since you’re tapped into your industry, you know that there’s a target audience out there that would really benefit from what you’ve got to offer. Podcasts are one of the best ways to get the word out about you and what you’re offering. More people are podcasting than ever, podcast listenership keeps growing, and the average person is listening to more podcasts than they ever have. And podcasts are available on an increasing number of platforms, making them ever more convenient to listen to, no matter which music/podcast app listeners prefer. And, great shows typically have super-dedicated followings with not only a lot of listeners, but a lot of engaged listeners. People that could hear what you’re offering and actually take the leap to check out your website, join your mailing list, or follow you on Instagram. Given all of this, you want to land an interview with one of the biggest and best shows in your industry – you know it could be a huge boon for your business and help you reach some potentially awesome clients. But how do you go about getting interviewed on some of the most popular shows in your field? Hosts are often inundated with requests from would-be guests, and some of these hosts are incredibly well-known. Don’t be daunted. It takes three steps to land great interviews: research, pitch, and interview. We’ll break down these steps into their component parts and turn this big task into a manageable, enjoyable exercise that will benefit your business and grow your network in the process. Start by getting specific about your industry. Are you a life coach? Financial planner? Nutritionist? If you’re not already a big podcast listener, take some time to familiarize yourself with some of the big players in your field. You can do this by checking out top podcast lists on iTunes, Stitcher, Google Play, and directories like RadioGuestList. Buzzsprout also has a great compilation of directories you can use to discover podcasts that would be a great fit for your offering. Let’s say you’re a life coach who focuses on helping business owners reach their full potential. You want to be on podcasts about business, entrepreneurship, and possibly about life coaching, too. On iTunes, you can select the “Business” category from the “Podcasts” category in the iTunes Store. Now you can see the top business-related podcasts on iTunes, and start getting a feel for who’s out there and what their audiences like. 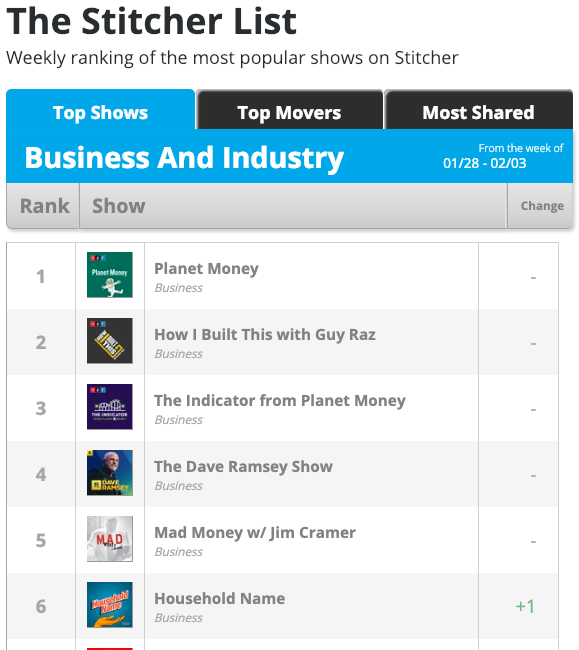 You can also do this on Stitcher by selecting the “Business and Industry” category on the right-hand side, which will take you to the Business Stitcher List. You can also use the search bar in the upper-right corner of iTunes’ Podcast Store and type in keywords that are relevant to your offering, like “business coach”, “life coach”, etcetera. Try a few different searches and different combinations – there are tons of podcasts out there, but not all of them will come up right away. Once you’ve found several great shows, make a list and keep track of what they’re called, who is the host, and specific episodes and topics you liked. You don’t have to listen to every hour of every show, but listening to a couple episodes from a few different hosts will give you a good idea of what’s currently being offered, where your expertise can have its biggest impact, and how your business might attract clients who aren’t being served yet. Be sure to check whether or not the shows you’re considering are still active; if they’ve published episodes pretty regularly in the last weeks and months, it’s a safe bet to assume a show is still on the air. This show updates regularly and its most recent episode was released within the last month. That kind of production schedule is a safe bet to pitch to! If the show hasn’t updated recently, the host might have decided to wind the podcast down or take a break. You can still reach out, but keep in mind they may not reply or may not be planning to interview anybody anytime soon. Now that you’ve got a list of interesting shows and industry-specific topics, consider which of those topics are most popular and being discussed by almost everyone. Do you have a unique twist on the conventional wisdom? Maybe you have a new approach to social media marketing that listeners would be super interested in. Get specific about what topics you can speak on because of your expertise and experience and identify where there are gaps in the discussion where you could create unique value. These topics should also be easy to find on your website and/or social media, so that when you’ve contacted hosts they can easily see what you’re an expert on. It’s also worth checking out a show’s website, Twitter, Facebook page, Instagram – whatever social media they use to connect with their listeners. Is the show present and consistent in its engagement? Do the host and their team promote the episodes when they come out? This step can give you a good idea of the reach a given show might have and how your promotion strategies align with a given show’s. Now you’ve done your research and have a list of shows you’d be a great guest for: shows that align well with your industry & that have engaged followings. You’re also really clear about what topics you love speaking about and how your story and offering could benefit listeners. Now it’s time to prepare your pitch! Key takeaway: Your research should help you narrow down which shows you’re the best fit for & with audiences you can serve best. Ideally, you want to be on a show that’s aligned with your industry, maintains a loyal and engaged following, and that would allow you to provide unique value to the audience. The most important thing to keep in mind when writing your pitch is this simple motto: make it easy for the host to say yes. And once they’ve said yes (woohoo! ), lay the groundwork for a great interview and a mutually beneficial relationship going forward. Demonstrate that you’ve listened to the show. Everyone wants to know their show is reaching people and having an impact, so talk about how a particular episode or the show overall has affected you. And be honest! Actually listen, enjoy the show, and imagine what it would be like to chat with the host. It will be clear from your pitch if you’ve actually listened. Build rapport. Share a bit of your story and how you got to where you are. Highlight common interests you have with the host and the show’s audience. And if you know anyone that’s been featured on a previous episode, mention them and how you know each other. Podcasting is all about building communities and relationships. Even if you don’t get interviewed on the show you’re pitching right away, this initial discussion can be a springboard for a relationship down the road. Be incredibly clear about what you have to offer this host and their audience. Hosts want to produce great content, and you can help them do that – but they have to know exactly what you’re offering before they can decide if they want to collaborate with you. Include a powerful sentence or two about your business/offering and why you’re an expert on this topic. Hosts want to create value for their loyal listeners. Show that you share the same goal and you’re not just in it for the marketing potential! Prove that you can do it. If you’ve been a guest on other podcasts, link to one or two episodes that are particularly good and that are relevant to the host’s show and audience, if possible. If you haven’t been on a podcast yet, highlight any other similar interview or media experience. This is also a good reason to pitch smaller podcasts before you try to land the big ones – you get practice pitching and interviewing, and will have something awesome to show for your effort! Be original. Hosts get many requests for interviews, and really big shows are absolutely inundated. Make sure you put your own unique spin on the pitch and don’t use a cut-and-paste template; nothing is more annoying for a host than realizing that somebody who’s asking to be on your show couldn’t be bothered to do their research and share what they genuinely like about your work. Keep it short. You want this to be an easy yes for the host – not a yes that comes after reading 5,000 words about your journey as an entrepreneur and why they should book you. Make sure all the relevant information is included, but don’t write an email that will take ten minutes to read. Before sending off your pitch, do a quick audit of your own online presence. The host and/or their team will definitely check out your website, social media, and offerings before saying yes to interviewing you. Is your website up to date? Are there any broken links, especially on contact forms or pages that showcase your previous work and media appearances? Is there a page that clearly outlines your expertise and what you like to speak about? You should also double check that any personal and professional social media pages like Twitter, Facebook, and Instagram are appropriate and active. This doesn’t mean you can’t express yourself through these mediums – you should be yourself and show off your personality. You should also demonstrate that you care about your industry, your offerings, and your target audience/ideal client. And if you’ve been on any other podcasts, be sure you’ve promoted them! This will show that you are familiar with being a guest and care about spreading the content you’ve helped produce. You nailed the pitch and landed the interview! After doing a little celebration, follow up with the host. Thank them and share your enthusiasm for appearing on the show in the near future. From your research, you should have an idea of their upcoming projects, but if not, ask if they have any books launches, programs, or blog/podcast series coming up about a topic you’re an expert on. Let them know when you’re launching your offering and see if you can coordinate the interview at a time that will coincide with your other promotion. If you’d like to have a sense of the questions they are going to ask ahead of time, let them know now. Is there anything they certainly want you to cover? Anything they want you to steer clear of? It’s a good idea to prepare a bit ahead of time so you aren’t speaking completely off the cuff in the interview, but still sound natural. Key Takeaway: Your pitch should make your hosted excited to say “Yes!” They should have a great sense of who you are, what you’re going to give their audience, and why you’re an expert on your chosen topic. They’ll be looking forward to talking with you! The three things you want to be as a guest are prepared, considerate, and generous. Before the interview starts, make sure your setup is ready to go. Ensure you’re in a quiet space and remove any jewelry or watches that might make loud, clanking noises. Silence any phones, computers, and other electronics. Tell any family, roommates, or pets that you’ll be on the phone and ask them to be quiet. Check that your headphones and mic are working and ready. Many guests use headphones with a built-in mic (e.g. iPhone headphones) to record, and these are just fine. Using headphones is a good idea because the host won’t hear themselves echoing through your mic. If you have a more elaborate podcast setup, make sure everything is in order – your mic is plugged in, headphones are working, etc. During the interview, you want to be engaging, interesting, and generous. Don’t hold back; share your best advice and stories. This is your time to shine and show your ideal clients why you would be a great person to work with, buy a book from, whatever your goal is. Have fun talking with the host, pay attention to their stories and experiences, and try to offer as much value to the audience as possible. To wrap up an interview, share where listeners can find you online and how they can get in touch with you. Be sure to highlight any freebies on your site that would be of particular value to this audience and tell them clearly where they can be found. Afterward, follow up with the host to thank them again for their time and offer your help in spreading the word about the episode once it’s published. Key Takeaway: Great guests can be hard to find – be considerate, engaged, and generous – before, during, and after your interview. If you’re a great guest, you’ll be able to show other hosts that you’re good at this, that you have their audience’s best interest at heart, and that you’ll help them produce a great episode. Start out small. Being a guest on smaller shows is a good way to build confidence and prove that you know how to be a great guest. You’ll also make friends and connections in the podcast world that can open up other interview opportunities. Great guests can be hard to come by, and word will spread if you’re a guest that brings their A-game to every interview. Invest in some good equipment! If you want to be on podcasts a lot, it may pay to invest in a nice mic and pair of headphones. There are plenty of mics out there that are pretty affordable, and having a dedicated, high-quality setup will ensure your audio comes through crystal clear, which will allow listeners to focus on your message. If you really love podcasting as a medium and would love to see what it could do for your business, consider starting your own show! You can become the hub of your own podcasting network. You’ll get to share content how and when you want, gain experience interviewing interesting people in your field, and build a community around your brand and your offerings. It’s great practice for being on big shows, and you could offer a reciprocal interview to hosts you really hit it off with. Having a great podcast takes serious work and commitment, but the payoffs can be huge. Being interviewed on podcasts can be a great marketing tool, and it helps build your network, too. It doesn’t have to be a huge, scary undertaking to pitch to big-name podcast hosts – just be genuine, interested, and unique. In short, be yourself!